In recent years Mercedes has diversified with mixed results. Its Smart city car and A-Class hatchbacks are technically clever but not the design paragons you might expect, and there has been the wider issue of how well its cars are built, something which, to their credit, senior managers have owned up to, and the company seems to be working hard to improve on its late 1990’s nadir. 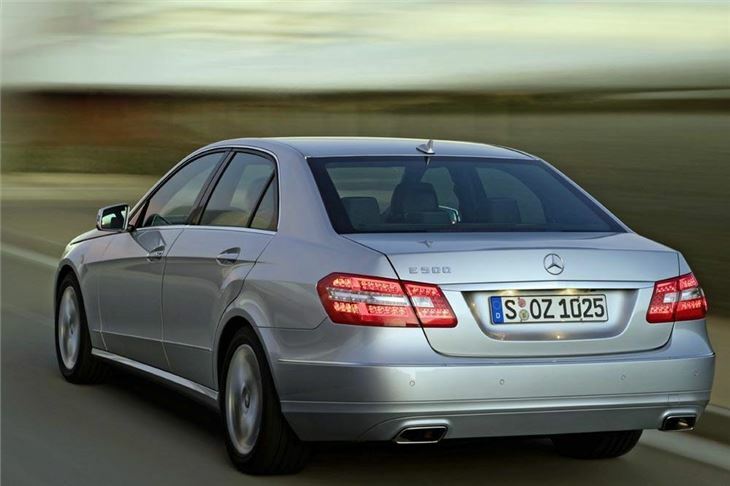 There must have been a sense of relief when the latest E-Class big saloons debuted, because they operate in a well-defined territory for Mercedes, and their predecessors have sold by the transporter-load to everyone from company directors to European cab drivers, because both valued space, engineering integrity and the capacity to last for a very long time. Actually, the two previous generations of this car, particularly the mid 1990’s-launched W210, was less robust, but this one is claimed to be a return to form. It certainly has acres of space for people and their chattels, a modern range of engines and the usual cleaner/faster/safer improvements found in new cars, although it’s a bit anonymous looking (excepting the genuinely distinctive coupes). 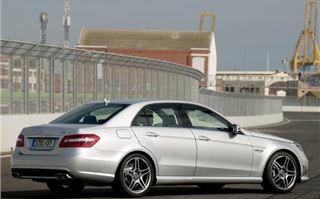 Perhaps to prove that there’s more to the car than Bourgeois sensibleness; Mercedes has unleashed a go-faster AMG version. 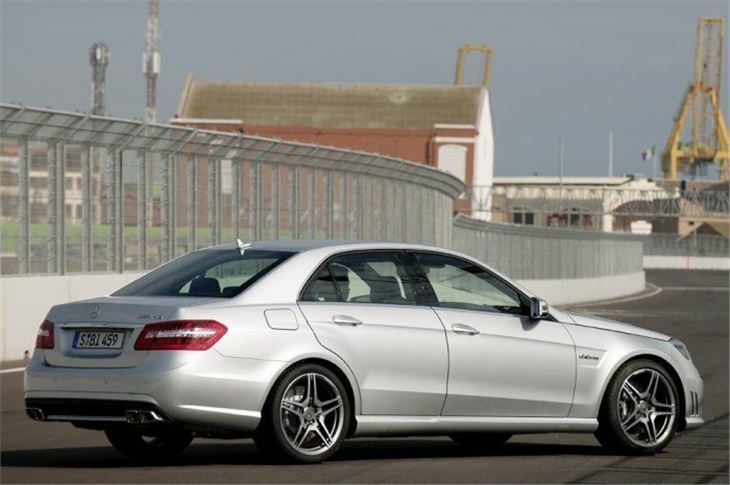 Called the E 63 AMG, it’s a full on supercar disguised as a sober saloon. The thing is powered by a 6.2-litre, normally aspirated V8 (confusingly called the '63'), and is brutally quick, being capable of a claimed 4.5 sec 0-62 and electronically limited to 155mph, thanks to a tractor-like 525bhp power output, and the capacity to be revved to 7,200rpm. 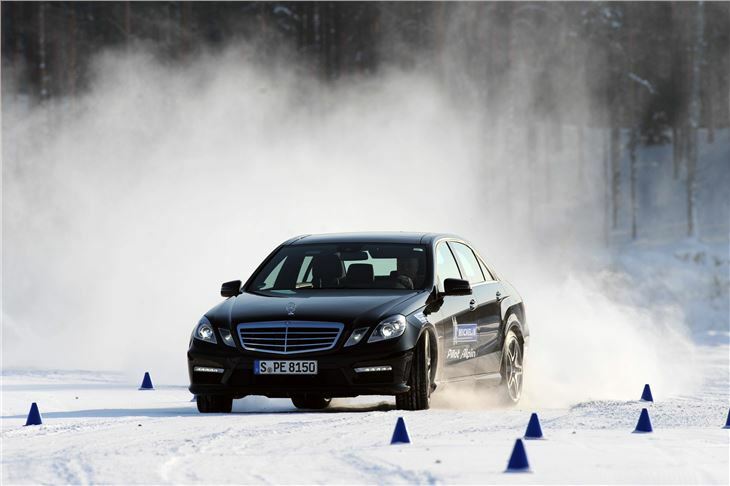 AMG has been making Mercs go faster for decades. Each engine for this one is assembled by a single technician in a surgically clean workshop. The end product is immensely tractable and easy going. In normal road conditions it’s relaxed, flexible and civilised, but sounds like a bespoke hotrod when roused and delivers its power like a wrecking ball going through the side of a building. There are nods at social responsibility though, with an alternator that recoups energy that would otherwise be lost when the huge brakes are applied, and a clever fuel metering system. The engine is mated to a seven-speed, four-mode transmission that works like a regular, two-pedal automatic, but uses a wet clutch rather than an energy-sapping torque converter. It’s a good piece of kit, very fast and smooth, whether left to its own devices or controlled by the steering column paddles or short-throw, transmission tunnel selector, which uses a fly-by-wire system that will find its way into other Mercs. In uber-nutter mode the engine is sometimes automatically ‘blipped’ during down changes to match its speed with the transmission. Essentially this is a software-controlled double-de-clutch. The transmission plays a big part in making this car 12 per cent more efficient than the outgoing E-Class AMG. Its makers even claim a combined 31mpg, although we suspect real world driving will be rather less frugal. The adjustable suspension has been given a serious workover, with a newly developed front axle which uses steel springs and electronically controlled dampers. The rear end has air suspension, and this very large car can be stuffed into bends with near roll-free confidence, helped by rapid, accurate speed-sensitive steering, thanks to a specially designed rack. The car sits on waterwheel-sized alloys and is shod in giant, low profile tyres, but despite this and the suspension’s sporting bias, it rode remarkably well on generally well made German roads. 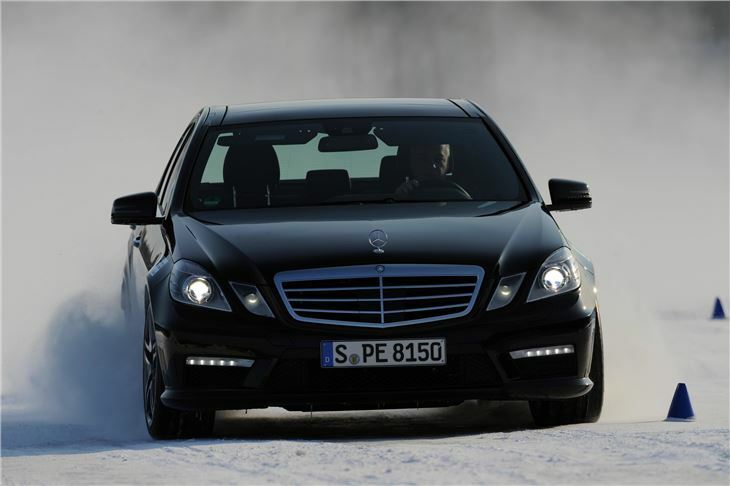 The AMG is laden with the sort of electronic traction control gear which is impressive because you don’t really notice what it’s up to, and the car can take off like a motorcycle without deviation or skittishness. activates if the thing senses its driver is getting drowsy. The expansive interior uses a lot of dark plastics and leathers, making it slightly funereal if well screwed together. Externally, the car has been given some low-key adornments to make it stand out from its more sedate range-mates. These are tasteful and discreet, but like the huge sports wheels, sit slightly oddly on this deliberately staid looking saloon. 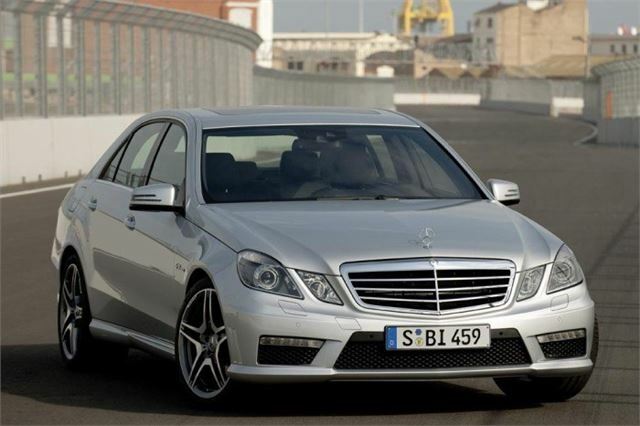 As this is written, Mercedes still hadn’t confirmed prices, despite the E63 AMG officially having gone on sale in Britain, although the hundred or so people who are likely to buy one will get some change from £70,000. The price, coupled with the car’s spectacular performance, perhaps make it almost perversely untypical of the E-Class as a whole, although it shares the range’s mix of design thoroughness and taxi-like space. To anyone for whom economic belt-tightening means downsizing from a Bentley, it might have a lot of appeal.